I’ve written a great deal about the holes in Australian (and global) climate policy. As such discussions can get very complex and confusing, I decided it was time to try a more visual format for a change. 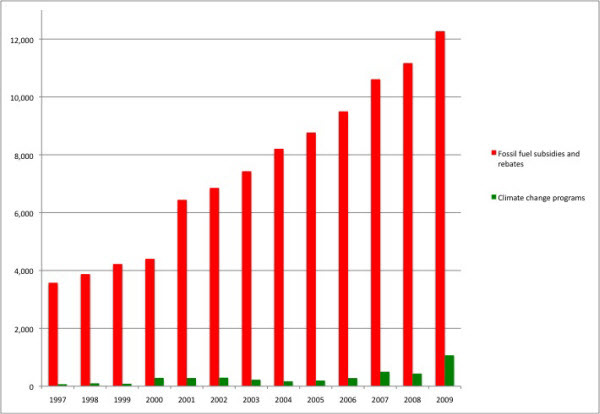 The following graphics dramatically illustrate just how ineffective the Gillard government’s climate change policy is. Let’s start by putting Australian policies in their global context. Despite an international agreement to take urgent action to limit global warming to less than 2°C (a target which climatologists now realize is itself quite dangerous), countries’ national emissions targets do not remotely add up to that global objective. 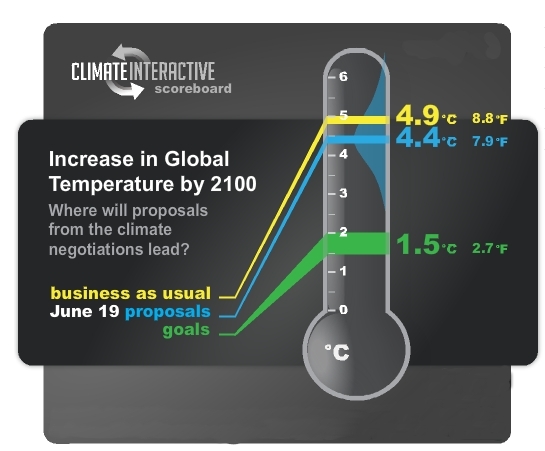 Even assuming countries meet their targets (which some don’t appear to be doing), the Climate Interactive scoreboard shows the Earth remains on a pathway to over 4°C global warming by 2100 (and feedbacks could cause more warming on top of that). Australia is not aiming further than the rest of the world – indeed we are a laggard. Australia continues to play an obstructive role in global climate talks, and has pledged to cut emissions a mere 5% by 2020 (though legal emissions caps are yet to be recommended by the independent Climate Change Authority). And despite claiming to accept the science of climate change and having signed up to the 2°C target, the Australian Government seems unperturbed by the ambition gap. If we allow several degrees of global warming, humanity faces a very uncertain future. The biggest hole in Australian climate change policy, both literally and figuratively, is that it does not apply to emissions from the burning of fossil fuels after they leave our borders, which dwarf domestic emissions. Thus Australia’s carbon price, as Climate Change Minister Greg Combet boasts, will not significantly raise the price of coal mining (adding less than $2 to a price measured in hundreds of dollars). On the contrary, the Government is allowing the reckless expansion of fossil fuel mining and export industries. Their energy policy is to ensure Australia exploits its fossil fuel resources and watch the profits flow in. Ministers passionately defend the industry against any attack. Australia’s fossil fuel exports could potentially quadruple in the next decade, making our exported emissions twice those of Saudi Arabia. 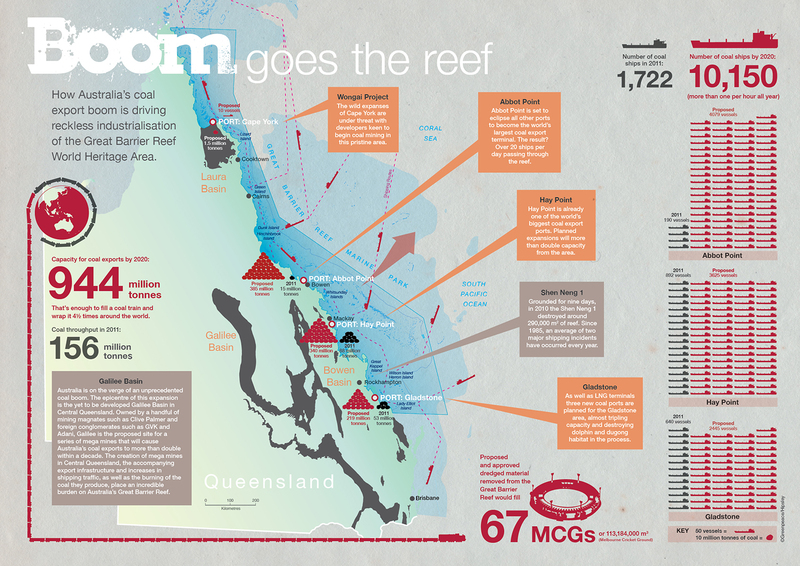 In Queensland alone, as shown in the above graphic from Greenpeace, mining companies are planning mines and infrastructure to extract nearly a billion tonnes per year of coal and gas and ship it through the Great Barrier Reef World Heritage Area. The excuses for fossil fuel exports don’t stand up to scrutiny: our exports are our responsibility. Keep in mind as we look at the rest of the graphics that they apply only to domestic emissions, so even if we were to fix all the problems they illustrate it would still leave the giant hole illustrated above. I know this graph is rather technical, but basically it shows different estimates for the cost of emitting a tonne of CO2. The true cost could be up to US$893/tonne (AU$865/tonne). That’s a worst-case estimate, but almost all the estimates number in the hundreds of dollars. In other words, there is a significant risk the damage is so high that practically any measures to move to a zero-carbon economy are worth taking. On a more practical level, a price of above AU$70/tonne might be required to make renewable energy competitive with fossil fuels. Yet Australia’s carbon price is only AU$23/tonne. In 2015, it will become an emissions trading scheme, with the price set by the market within the framework of the emissions cap set by government. 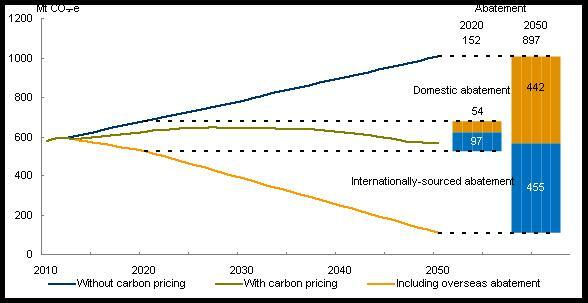 If the current weak target is adopted, the carbon price will remain similarly weak. And with no floor price, there is nothing to prevent the carbon price from crashing. Investors must have certainty of a high carbon price in the future in order for it to drive decarbonization. This graph comes from Treasury modeling of the carbon price. I’m not sure how the new changes will affect the picture, but the Government says it “stands behind” the original modeling and has refused to redo it, so I figure it’s fair game. It projects domestic emissions will actually rise until the mid-2030s then fall back to today’s level by 2050 (green line) – with the 2050 target of an 80% reduction being supposedly met by buying international emissions permits (orange line). Of course, this is an improvement on business-as-usual (blue line), in which Australia’s emissions would have risen about 80% by 2050, but it’s utterly inadequate at a time when everybody needs to get to zero emissions as fast as possible. International offsets supposedly have no effect on net emissions to the atmosphere, but in reality they are a breeding ground for creative accounting. I accept carbon trading is relatively credible when it takes place in a single scheme with emissions caps and consistent rules, which is the case with Australia’s carbon price. It could also be the case with the agreed link to the EU ETS, but the details are yet to be negotiated. Fortunately the cheapest, dodgiest permits (from Kyoto’s Clean Development Mechanism) will now be limited to 12.5% of a company’s liability, though ideally they should be limited to 0%. However, Australia is also talking to New Zealand about linking to their ETS, which is a joke, and will be looking to link to other emerging carbon markets, which are unknowns. Wherever they’re coming from, all international permits will prevent decarbonization in Australia, whereas we urgently need all countries to decarbonize their economies at home. Whichever way you look at it, offsetting emissions overseas is not a serious way to tackle Australia’s contribution to climate change. We can and should cut our own emissions. 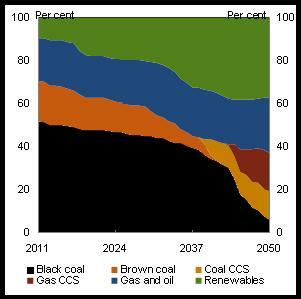 This is another graph from the Treasury modeling, showing projections for sources of Australian electricity generation. This is the more pessimistic of two models, but the other one is not much better. Contrary to the Liberal Party’s claim “the carbon tax is the death of the coal industry”, fossil fuels would still supply the majority of Australia’s electricity by the mid-2030s. After that, the Government hopes its pipe dream of carbon capture and storage will come true so fossil fuels can still dominate in 2050. We cannot wait until 2035 for real action. While the percentage of electricity generated by coal decreases in the modeling, the percentage from gas triples. The Government subscribes to the fashionable notion of gas as a bridging fuel, but this is a dangerous diversion. As a fossil fuel, gas is part of the problem, not the solution. The International Energy Agency warns new investment in gas would divert investment away from renewable energy and lock in fossil fuel infrastructure for decades, leading to dangerous global warming. Worse still, the IEA analysis did not account for leaked emissions of methane, which could make the climate impact of gas worse than coal in the medium term. The only realistic solution is to phase out all fossil fuels. The Government not only fails to oppose the fossil fuel industry but actively props it up. A carbon tax should make polluters pay, but it is working against perverse fossil fuel subsidies. 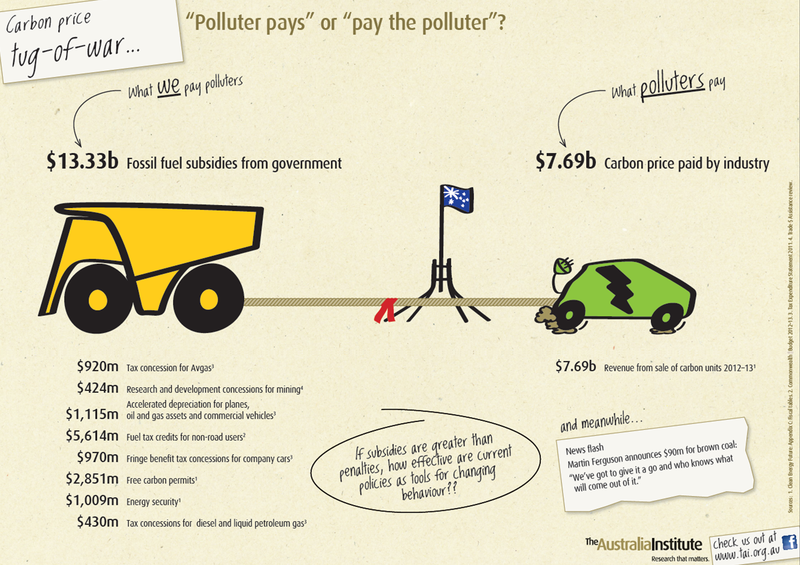 As this graphic from the Australia Institute shows, Australian taxpayers spend $13 billion annually subsidizing fossil fuels, greater than the $8 billion revenue raised by the carbon price. Note that if the carbon price falls when emissions trading starts in 2015, as is expected unless either the EU or Australia strengthens their policy, then the revenue raised would fall accordingly. 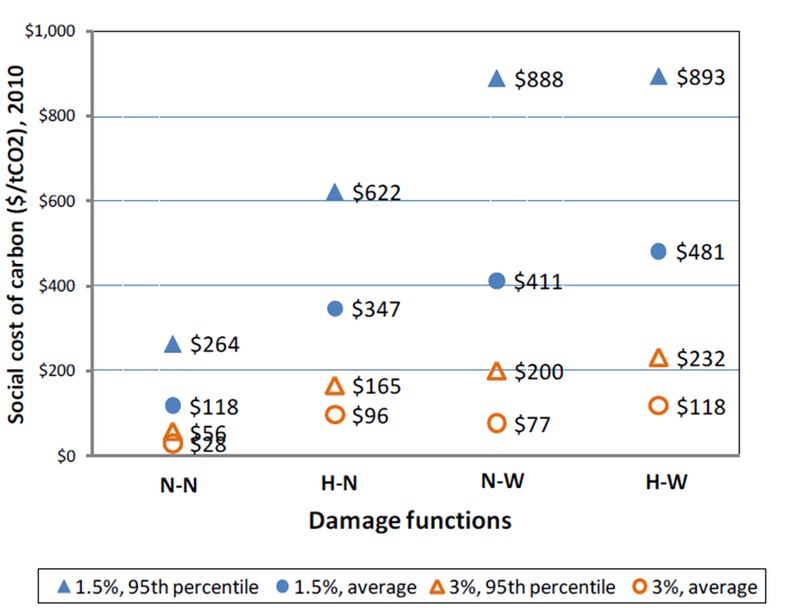 The $13 billion includes nearly $4 billion in carbon price “compensation” for polluters. Coal power plants get $1 billion per year, with the only condition being that they continue to operate, effectively locking in their existence for years. (UPDATE 6 September 2012: This compensation has actually increased the profitability of coal-fired generators by up to $1 billion and thus contributed to the failure of the Government’s plan to pay for the closure of 2,000 MW of coal power.) The highest-polluting trade-exposed industries get 94.5% of their emissions permits for free, diluting the $23 price to $1.27. These absurd levels of compensation are guaranteed in law for at least five years, and the number of free permits could rise in future. The stated excuses for all this compensation have changed over time, but none of them convincingly justify the Government’s extravagance. This is the sort of thing you’d expect to have free market advocates up in arms. Their silence on the issue betrays a double standard. This graph from Crikey unfortunately only goes up to 2009, but it shows how fossil fuel subsidies (red bars) compared with spending on climate action (green bars). In 2009, fossil fuel subsidies amounted to $12 billion and climate action a mere $1 billion. What would an updated graph look like? Climate spending has not risen, as only a small proportion of the carbon price revenue is spent on climate change; and may even have fallen, as the Government is using the carbon price as an excuse to cut other climate policies. This financial year, the Government’s main climate-related expense is probably $300 million for the Australian Renewable Energy Agency, making fossil fuel subsidies about 40 times renewable energy subsidies. When the new Clean Energy Finance Corporation begins investing in July 2013, it will have $2 billion to spend per year, so next financial year fossil fuel subsidies will be about six times renewable energy subsidies. Worse, some of the purported “clean energy” funding will go to fossil fuel technologies. All this contradicts the Government’s stated vision of a “clean energy future”. In addition to international offsets, polluters will be allowed to buy unlimited amounts of Australian land carbon offsets. Contrary to the belief of many emissions trading enthusiasts, not all tonnes of CO2 are equal. 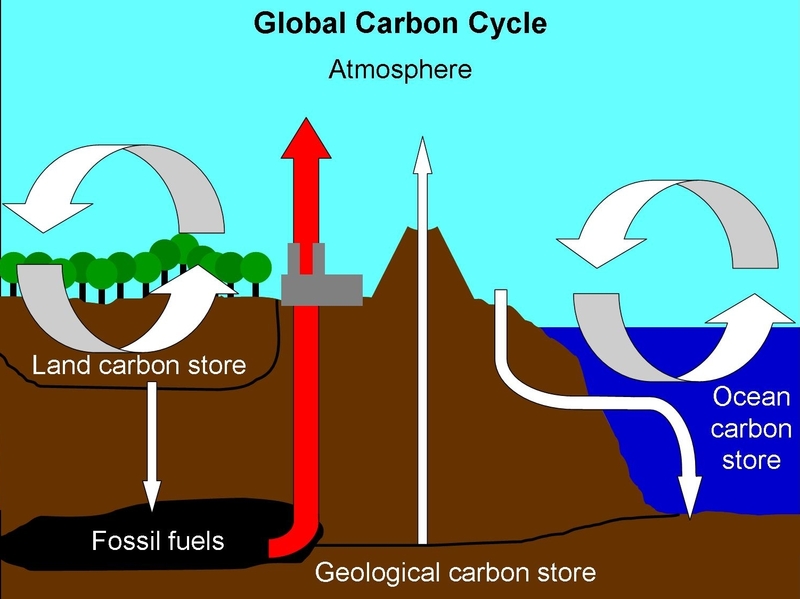 As shown in my diagram above, on human timescales carbon easily moves between the atmosphere, ocean, and land (thick white arrows). It is only over geological timescales that these “surface reservoirs” exchange carbon with deeper, larger reservoirs (thin white arrows). Examples of the latter are emissions from volcanoes, absorptions from weathering, and absorptions from fossil fuel formation. The most important thing humans are doing is mining and burning fossil carbon that has been buried for millions of years (red arrow), thus emitting carbon at a pace many orders of magnitude greater than the rate of the processes which remove carbon from surface reservoirs. In contrast, land use only moves carbon from the land sink to the atmosphere; these emissions are less important than fossil fuel emissions, as they are both smaller in amount and more temporary than those from fossil fuel burning. While storing more carbon in the land is a necessary part of climate action, it is far from sufficient and not nearly as urgent as eliminating fossil fuel emissions. Even if forest cover was returned to preindustrial levels, the carbon cycle would still be overwhelmed by fossil fuel emissions. The fossil carbon will stay aboveground for millennia, and the land is a climate feedback so cannot store carbon permanently. Finally, from a practical perspective, land carbon is harder to measure and thus another potential avenue for creative accounting (as we’ll see in a moment). Whatever way you look at it, fossil fuel burning is the most important impact humans have on the climate and the most urgent thing to get under control. Despite Australia being allowed to increase our emissions by 8%, the former Howard government refused to sign the Kyoto Protocol without a special provision that would make our target even easier to meet. Dubbed the “Australia clause”, it allowed Australia to inflate our 1990 emissions from land clearing and set an unrealistically high baseline. The present Gillard government has continued this creative accounting, using the Australia clause to claim Australia’s emissions have increased by merely 2%. 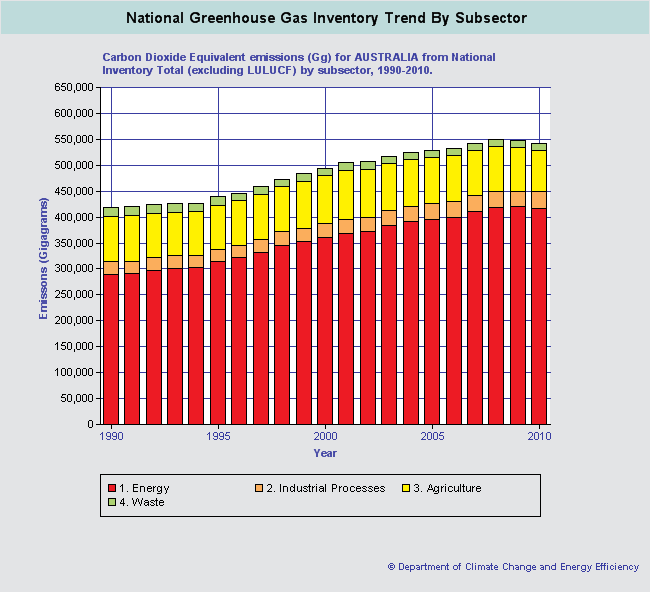 In reality, as the above graph shows, Australia’s emissions excluding land use increased by 30% from 1990 to 2010, and emissions from the energy sector rose 44%. In ongoing negotiations about the second period of Kyoto, Australia is arguing for dubious accounting rules in at least two ways. Firstly, the Government is refusing to stay in Kyoto unless we are allowed to use a land clearing baseline we cannot exceed (which is like saying you’ll only turn up to the Olympics if you’re allowed to take steroids). Secondly, because we appear to have overachieved on our Kyoto target thanks to past creative accounting, we have surplus emissions permits which the Government wants to carry over to the second period. Australia must stop fiddling the figures and instead focus on real action. As I alluded to earlier, Australia and the EU have recently agreed to link their emissions trading schemes from 2015. Both policies are deeply flawed, and linking them will allow them to contaminate each other with their flaws. It also means Australia and Europe will share the same carbon price. At the moment the EU ETS is flooded with surplus permits, which have caused its carbon price to plummet to €8/tonne (AU$10/tonne), as shown in the above graph. European politicians are debating whether and how to rectify the situation, but so far coal-addicted Poland has succeeded in blocking progress. Even if the European price recovers, polluters are allowed to buy EU permits now at the current price and use them later. Again, this is important because a low carbon price will not drive the investment needed to decarbonize our economy. With some of these graphics, the precise numbers may be open to dispute, but the big picture is clear. Australia’s climate policy is disaster piled upon disaster. It will not get us off fossil fuels. We – and the rest of the world – desperately need ones that will. Before 2035. Nice post. Agree with your analysis.